Hey corporate America…cut out the “hip” April Fool’s jokes. | MEOW hear this! Hey corporate America…cut out the “hip” April Fool’s jokes. Another April Fool’s Day is here, and with it brings a trove of companies trying to show the youth how “in touch” they are with them by making up random products and hoping enough people fall for it that they get some good viral marketing in. I suppose I can’t blame them for trying. Cmon, Google Nose! Who were you trying to fool? The only way this one would have amused me would be if before you allowed people to “smell” things from the internet, you made them consent to putting their web cam on. Now THAT would be a joke I would get into. How many morons lean forward, close their eyes and try REALLY REALLY hard to smell a diaper? Post the stupidity. Then I’ll applaud you. Among the jokes today was one that didn’t seem to get a lot of media coverage, but was the only one I mildly enjoyed, and only because there was a cat involved. Thank you, Sony, for not trying too hard. Simple really is sometimes the best way to go. 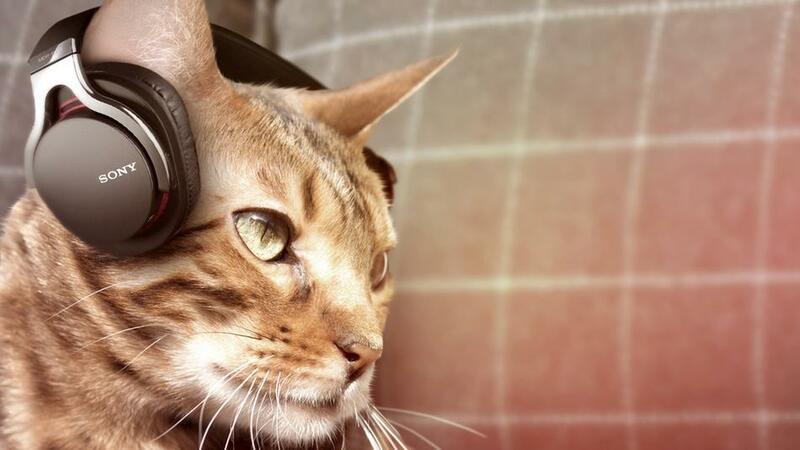 This is the photo of a cat rocking out with a pair of M3-OW KittyCans. I even love the name they came up with. Again, simple. And cat-related. I bet he’s listening to Weezy’s new album! The effort some of these companies went to is pretty crazy. I didn’t notice the Sony one though, good find. It was luck! My brain is trained to look for “cat” in small descriptions. Missed that one too, good one. I might have been fooled too except I’d be thinking…”ya, those would stay on for 2 seconds” I actually did go and buy one of those ‘white noise’ machines people use to go to sleep. It has a rain forest with chirping birds, the Diva’s love it. Not marketing it right….crazy cat people would totally be the right niche. Hah the only thing I ever play for my cats is other cat noises on an iphone app. Drives em nuts! If I wear the cats out enough, quite well!